Caring Advice. I have been coming here for at least ten years. I’ve always had a wonderful, and warm caring experience here. Dr. Blaze is so caring and any questions I’ve had even when he’s not in he’s always got back to me. Laurie has been a blessing as well. Her knowledge and advice are always right on target. The receptionists are very sweet, as well! Funny & Caring The staff IS very helpful and professional. Funny and caring !!!!!! !The coffee is GREAT!!!! ********** Very personable!!!! I Feel Welcome My experience was great . I walk in and the welcome was overwhelming. Each experience is difference, it feels like going to a family member’s home. I truly like coming to get my eyes checked each year. How many offices give you something to drink? They Got My Contact Lens Prescription Right! Fantastic experience! From the moment you walk through the office door you are treated as if you are family. I have searched high and low for someone who could get my contact lens prescription correct so that I could discard my dime store readers. Dr. Blaize did it. He listened patiently to my issues and worked with me week after week until he found just the treatments and prescription. I am so happy to rid of the readers. Laurie, Dr. Blaize and the rest of the staff care about their patients and their patients eye health. I appreciate the entire cast more than they can know. Top Notch Service My wife and I went in for our eye exam there and it is a quiet and quaint place. The eye exam was is typical as you would find in many other places, but the customer service is top notch. We browsed Costco’s selection of frames but they were not as nice as Bayview’s. Bayview has a friendly staff. Dr. Blaize is laid back and very kind. The staff does not pressure you into buying anything. My wife got a pair of glasses and they bothered her. We went in every week for 3 weeks and they made sure that everything was OK. We eventually ended up going with a different frame and they were very helpful in the process and helped us out. I would highly recommend this place. It is the type of place I would take my own mother to. Patients for Many Years Professional and friendly. We have been patients for many years. I Refer Bayview Optical to My Friends I have been going to doctor Blaize for years. He and his staff are great! It’s a great atmosphere. I refer him to all my friends and family. Zero Complaints Great Team! Such a fantastic team! They really know how to take care of you and your family. I’ve been coming here for 10 years now and have zero complaints. They whole crew is thorough and understanding. There is no pressure to buy something that you don’t need. I plan on coming back every year. Knowledgeable Staff Been coming to Bayveiw for years. First class operation. The staff is knowledgeable and friendly and they have a great selection. You’d be hard pressed for find a better experience elsewhere. Great Customer Service! I would highly recommend Bayview Optical! The customer service of the staff is top notch and they always make you feel welcome. Dr. Blaize is professional and thorough! I have been going to the office for several years and feel like family. I am able to get in and out quickly while still getting everything I need done. Great experience every time! Great Experience! I have always had a great experience at “Bayview” optical. I was running late for my appointment and the staff had no problem with making additional accommodations to make sure I was able to see the doctor! Their staff is always extremely nice and they have the ability to get you in and out! Informative It was informative. I learned new things about my eyes. Livonia MI optometrist Livonia MI optometrist Dr. Blaize listened to and addressed all of my concerns about my vision. His staff was friendly and helped me find a pair of glasses that I feel good about. Thank you for your great service! Donations from Bayview Optical Help Local Woman I recently moved to Indianapolis because my son is deaf and they have a really good school here for him. It was an easy decision to make because I know it is what’s best for him. But I knew the process of moving and making it on my own was going to be a struggle. The day before we began our move I was surprised with a party/benefit for my son and the person who came up with this idea was Laurie. The point of the party wasn’t just to help me out financially but it was also to show me how many people love and care about us. I realized how many people are behind me supporting this decision and willing to help in whatever way they can. I was really touched that someone cares that much about me to do something like this for me. Not only did I have Laurie to thank for that but there were also several pairs of sunglasses donated from Bayview Optical for a raffle. I was really overwhelmed with all the emotions I was feeling, the fact that someone was willing to do something so thoughtful really touched my heart. There aren’t too many people and places that do things like this out of the kindness of their heart. She didn’t have to go out of her way, but she did because she cares and that is the type of person she is. It just goes to show what kind of employees Bayview Optical has. I will never forget that day, and I will always appreciate what Bayview Optical did. Our Family of Six Has Loved Bayview Optical For Over Ten Years Dear Dr. Blaize, Laurie Morris and Staff, Kudos to Bayview Optical! My family of six have been with your business for ten years. You have always been patient as our children grew from preschoolers through the teen years and now as young adults. Thank you for all that you have done for our family. As you can imagine our needs vary with glasses, contacts, and possible glaucoma. Your company and staff continues to grow with knowledge, technology, and varied up-to-date products. Always keeping our needs your first priority! You are all so friendly and kind. We feel so fortunate to have found the best eye care! Quality Of My Glasses Exceeds The Cost My experience at Bayview Optical was top notch. The staff was professional and very kind. The quality of my glasses exceeds the cost. This is my first time wearing glasses; Laurie and Talea helped me pick out the perfect frames. Dr. Blaize is very knowledgeable and kind. I highly recommend Bayview, as I am sure you will also have a positive experience. 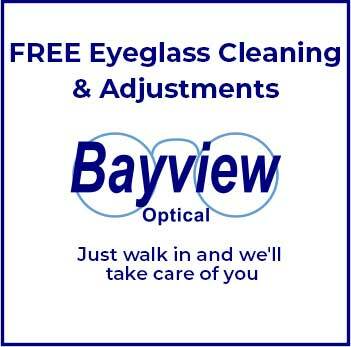 No Other Place I’d Rather Go – Jan. 7, 2012My family has used Bayview Optical for many years now and we have always had great service with them! The employees and Dr. Blaize are extremely friendly and helpful. There is no other place I’d rather go for the care of my eyes. Taken Great Care Of My Eyes – Jan. 5, 2012I have been a patient here for almost 10 years. I typically go 1x per year for an eye exam and contacts. Dr Blaize has always treated me well and taken great care of my eyes. His staff is friendly and make scheduling an appointment very easy. Excellent Service In Eye Care Bayview Optical offers excellent service in eye care. My visit was extremely efficient with a very short wait time, which I appreciate with my busy schedule, and the office staff was very friendly. The optometrist was great and patient as I tried on multiple contacts. They also had a supply of my contacts in stock so I did not have to return to pick them up at a later date. Overall, I felt that I received quality care and would recommend this office to anyone! Bayview is great. My wife and I have been going there for years and will be keep coming back!! Very pleasant staff. I felt really welcomed and it was an enjoyable experience. I’ve worn glasses for 30 years and this is the best service I’ve experienced by far. Extremely knowledgeable, helpful with with all issues. Dr. Blaize knows his stuff and Laurie is so capable and friendly. Excellent service! Our family of five starting coming here four years ago and have loved it ever since. Dr. Blaize and Laurie always treat us like family, yet, they are very professional in providing top notch service. 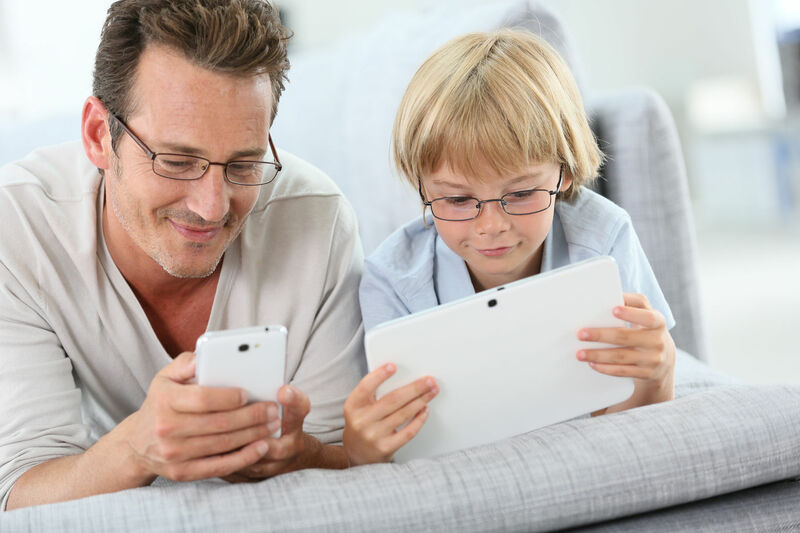 They are well informed of insurance plans, and are quick to provide good advice and guidance on choosing the right type/form of eye wear, from every day glasses to sports-safety wear. They also offer a good selection of prescription sunglasses. I would strongly recommend Bayview Optical to anyone who is looking for great service. Thank you Dr. Blaize and Laurie’s staff. Restored My Eyes To Excellent Condition Wonderful results! When I first began seeing Dr. Blaize, my eyes were in extremely poor condition due to overuse of my contacts. As he described them, my eyes looked like “an ocean with rough waves” when they are supposed to be clear. After prescribing a treatment plan, Dr. Blaize has restored my eyes to excellent condition. I am extremely pleased and highly recommend his services. His staff will make you feel right at home from the moment you walk in the door! Eye Exam To Glasses Selection Our family highly recommends Bayview Optical. They offer friendly, kind service from the reception desk, to the eye exam to glasses selection. They know our family and are able to offer personal service – we are not just another patient. I have referred friends here and they have thanked me for sending them to such a great office. You won’t be sorry! Knowledgeable Very helpful and knows what he is doing. The staff and doctor are knowledgeable and always pleasant; I actually look forward to my annual checkups! I have been coming here for over 11 years and I have always been very satisfied with the service that I have received. It is easier to remain consistent with checkups since I enjoy the interaction with my optometrist and his staff; my vision has benefited as well. ‘Eye, laddie! Special Lenses This place is friendly, professional, and caring. I trust Dr. Blaize with my eyes! I have astigmatism and hypertropia (lazy eye) which requires special lenses. The Doc can also provide me with no-line bifocals. The office staff is so great! My family of five come here and I feel safe and well cared for. The Most Thorough & Helpful I’ve been going to eye doctors for the past 14 years. While all did their jobs, none were as thorough and helpful as Bayview Optical. The staff was very friendly and made my experience enjoyable. I will definitely be going back! First Pair of Contact Lenses Just got my first pair of contact lenses. The staff was friendly and professional. Thanks for taking the time to answer my questions and get me contacts in the same day! Great Livonia Optometrist I have been seeing Dr. Baize since he took over the practice. I have always felt good about the quality of attention and care provided by him and his staff. I moved from Livonia to Farmington Hills but continue to return to Bayview. Family Optometrist My experience at Bayview Optical has always been great. Dr. Blaize is very knowledgeable, and has a very patient staff. Everyone is very helpful and ready to make you satisfied with your experience. They have very stylish frame choices, with a generous selection. I have absolutely no complaints. My whole family is treated by Dr. Baize and his staff and we couldn’t be happier! My friend recommended Bayview Optical My friend recommended Bayview Optical and I’m glad that he did. The environment is friendly and they try to help you out as much as they can. They are very nice people and give great service. High Definition Vision With Transitions, Varilux, and Crizal lenses, I now have high definition (HD) vision [to watch Ultra HD TV 4K]. Thank you Dr. Blaize, Laurie, Jessica, and Michelle — “it is a pleasure to have the best optical experience”. Thorough Eye Exam I’ve been visiting Dr. Blaize for several years The eye exam is VERY thorough and the staff is VERY NICE!! !… I would truly recommend to others. Help with Frames & Contact Lenses Since I started coming to Bayview in 2013, the whole entire staff has been FANTASTIC. They adjust my frames when I come in for other items, Laurie is always a great deal of help with my decision making in frames and or contact lenses. They are truly the epitome of excellent customer service. The whole staff is phenomenal. I would rather be here at Bayview the Lens Crafters or anywhere else. Outstanding Service Outstanding service all around. Very knowledgeable and helpful. Making appointments is very easy. Everyone is very friendly and courteous. Professional Everyone is great, very professional and always polite. I would definitely recommend them. Friendly & Efficient The entire staff at Bayview is friendly, efficient, and willing to go the extra mile for their patients. I highly recommend Dr. Blaze and his staff! Best Optical I have been to about a dozen of Optical offices over the years. This is the best. Dr. Blaize is professional, knowledgeable and very caring. The office staff ROCK!! Laurie, Michelle and Jessica will treat you like old friends. They are extremely friendly and helpful. The office is clean and comfortable with a great array of glasses and other optical products. If you are looking for a new eye doctor. Look no further. Good Care I’ve been a patient for a few years now and I’m highly satisfied with the care received. Good Service, Nice People My visit was nice, the people were nice. I had good service. Helpful, generous, outstanding! Gave me everything I needed. I highly recommend everyone come to Bayview to get their eyes checked! The doctor and the staff was good! The Staff Always Remembers Me I have been coming to Dr. Blaize since 2011. He has been so accommodating with me. I HATE having anything in my eyes (drops, air, contacts). He has been very gentle and minimalist with my care while still being thorough. Plus the staff always remembers me and makes me feel at home. Good Selection of Lenses The staff is very attentive and knowledgeable. I feel welcome whenever I am there. The wait isn’t bad at all and I’m never feeling rushed when I leave. They have a very good selection of lenses to choose from. I’m not a big fan of reviews but I do think they deserve to be recognized for their excellent work. Eye Glasses for the Family Our family highly recommends Bayview Optical. They offer friendly, kind service from the reception desk, to the eye exam to glasses selection. They know our family and are able to offer personal service – we are not just another patient. I have referred friends here and they have thanked me for sending them to such a great office. You won’t be sorry! Dr Blaize Is A Wonderful Optometrist I feel Bayview Optical is a wonderful place for all your eye care needs. Dr Blaize is a wonderful optometrist that cares for his patients’ needs and the staff is really nice and always concerned. I would refer anyone to them! Knowledgeable, Helpful, And Friendly Awesome people here! I’ve been going to Bayview for a few years and will never go anywhere else. Very knowledgeable, helpful, and friendly. I also like to spend my money at local businesses like Bayview. Great Selection On Frames Great experience. Love the staff. Will be back every year. Great selection on frames. Glad I Chose Bayview Optical Very pleasant experience. Very Friendly staff. I just moved to the area and am glad I chose to go to Bayview Optical. I ordered contacts and they came in 2 days. I also was set up with a bunch of rebates for the contacts which always helps. Great Care And Friendly Atmosphere I have been a patient of Bayview since 2008. I have had nothing but positive experiences every year. Dr. Blaize and his staff are friendly and professional. They are accommodating when it comes to scheduling an appointment and when I am in the office I feel I am among friends. I have offered the highest recommendation anytime opportunity presents itself! I will not leave the care and friendly atmosphere Dr. Blaize and his staff has treated me to since I first became a patient. My Choice Of Eyeglasses I enjoyed my overall experience at Bayview Optical. The people are friendly and supportive in my choice of eyeglasses. The location is basically next door to my house, so that’s a huge plus, and Bayview also takes my current insurance. I would recommend this place to my friends and employees. Great! I was extremely happy with both the service and the friendliness of the staff at Bayview. The selection of frames is abundant, and my glasses were ready as promised. Dr. Blaize listens to my complaints, and answers all my questions. Can’t ask for anything more. Always Happy With The Service Dr. and staff are very nice and helpful. Very comfortable setting. Always happy with the service. Sometimes a bit pricey but overall a great place. Every Day Glasses To Sports-Safety Wear Excellent service! Our family of five starting coming here about three years ago and have loved it ever since. Dr. Blaize and Laurie always treat us like family, yet, they are very professional in providing top notch service. They are well informed of insurance plans, and are quick to provide good advice and guidance on choosing the right type/form of eye wear, from every day glasses to sports-safety wear. They also offer a good selection of prescription sunglasses. I would strongly recommend Bayview Optical to anyone who is looking for great service. Thank you Dr. Blaize and Laurie’s staff. Doctor Blaize and the staff at Bayview Optical are great. I’ve been a patient for about seven years and I’ve always been happy with the prices and services provided The staff – especially Laurie and Jessica – are always helpful and cheerful, remembering me from year to year. I always get compliments are my glasses as well, which is great! I can’t imagine going anywhere else. Outstanding customer service. Took care of a family of five that had not seen (no pun intended) an eye Dr. in years. Dr. Blaze was extremely thorough with his exams and was very nice and explained the eye, cones, pressures, etc in easy to understand terms. Lorie does a great job fitting you for glasses and has a great eye for what looks good. They have an extremely large selection of frames. I could not be happier with the service I received. Very quick turnaround on the glasses too. Thank you! My family and I have been coming for many years and the staff is awesome! They really take the time to get to know their patients. I have tried the “Mall” shops for both exams and glasses and every time I have to go back and see Dr Blaze at Bayview. I have bought glasses from Bayview and can not recommend their customer service enough. They have always gone above and beyond for my optical needs. A must see in Livonia.